Marseille will tie Rio de Janeiro in hosting the most SWATCH-FIVB World Tour events as the Mediterranean port city has staged an international Beach Volleyball event every year since 1994, except in 2005 when the organizer was developing a stop in Paris. The 14th event in Marseille is also the final qualifying event for the Beijing 2008 Olympic Games. While the men have completed in each Marseille event with Brazilians securing 19 podium placements and 11 gold medals, the 2008 women�s event will be Event No. 11 on the Plages du Prado Gaston Defferre. Only Osaka (12) has staged more women�s SWATCH stops than Marseille. The 2007 gold medal finish with Pedro Cunha by Franco Neto (40 years, eight months, 11 days) made the Brazilian the oldest player to win a SWATCH-FIVB World Tour event. Women�s teams from Brazil and the United States have split the previous 10 gold medals. 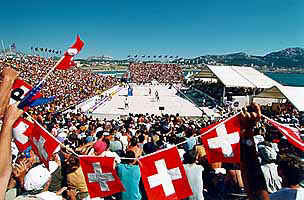 Marseille hosted the 1999 SWATCH-FIVB World Championships where Brazilians captured both the men�s and women�s crowns. France�s top finish by a men�s team was in 1994 when Jean-Philippe Jodard and Christian Penigaud dropped the gold medal match to Jan Kvalheim and Bjorn Maaseide of Norway in the first all-European finale on the SWATCH-FIVB World Tour. Ethel-Julie Arjona and Virginie Kadjo have posted ninths in Marseille (2003 and 2004) for France's best women's finishes as a host country entry. Pictured below are Brazilian winners in 2007 at Marseille (left to right), Renata Ribeiro, Talit Antunes, Franco and Cunha.